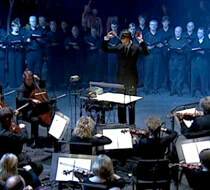 Ben is agraduate of the Guildhall School of Music & Drama where he studiedComposition and Conducting. In 2001 Ben was awarded a BAFTA scholarship tostudy for his MA in Film Composition at the National Film & TelevisionSchool under Professor Francis Shaw and Peter Howell. Work as acomposer includes over 30 scores for shorts for various European Film makers. Recent highlights include Can’t Stop Breathing (Best Short nomination 2005 BAFTAawards) and Gareth Lewis’s Normal For Norfolk. For Mcasso Music agency, Ben's TV credits include main titles for LWT’s Love on a Saturday Night, The Great British Test series for Granada, and the current arrangement of BBC’s Question Time. He has alsowritten music for a variety of advertising campaigns including The Times, Ford SreetKa, Sprite and Burger King. Credits as a Pop arranger include five Top Ten hits as well as album tracks for a widevariety of artists including S Club, Toploader, Boyzone and others. Ben alsoworks in the classical crossover field both as an arranger and conductor having recently worked with Aled Jones (Universal Classics), Keedie and the RPO (EMIClassics) and Hayley Westenra (Decca). His CV asa film orchestrator includes work on The Hitchhiker’s Guide to the Galaxy, The League of Gentlemen’s Apocalypse, Alien Autopsy and Death at a Funeral. 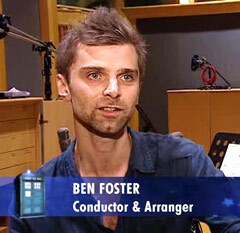 For the past two years Ben has worked with Murray Gold, orchestrating series 2, 3 and 4 of Doctor Who. Most recently, Ben has scored the second series of the BBC drama Torchwood (which he co-writes with Murray Gold), and was a judge on the 2008 BBC Young Musician of the Year. Gilles Nuytens: Gilles Nuytens: Firstly, how did you get into music? Ben Foster: Well, when I was very young, I studied piano. So from a very early age, about five or six, I started learning the piano. And then quite early on I started writing, composing music. Just about the age of six and just writing little songs and stuff. I come from a very musical family so it was always there when I was young. And then I had got to my teens and took it quite seriously. I did bits of rock and pop music and stuff, but I was always studying classical music in the background. I played various instruments, and I played the piano. Eventually, I decided to study music college. So, at the age of eighteen I came to London and study at the Guildhall School of Music, which was great and I had five years there and I studied composition. Then I went to film school in London and did a masters degree in how to write for film and television. So that was really how I kind of studied. And after I left film school, I started to get work and I started to get into the industry. Gilles Nuytens: So you entered the "Who-niverse" by conducting and orchestrating the Doctor Who soundtracks. Ben Foster: That’s right! Yeah! It was way back at the end of the first series that Murray got in touch with me. I had worked with some other composers that he knew. His manager recommended me. And so we met up and we seemed to get on well. Then I started work on the Christmas Invasion, which was back in 2005, in November. Just two and a half years now that I’ve been working on Doctor Who. So I worked on everything from the Christmas Invasion up-to-date now. Gilles Nuytens: Were you a Doctor Who fan? Were you fond of Doctor Who and its universe and of Russell T. Davis and many of the crew members? Ben Foster: Yes, absolutely. I mean, when I was a kid we’d used to go to see the exhibition. I lived in the North of England and there was an exhibition in Blackpool and so we’d used to go there every Winter. And I’d watch it on TV very avidly as a child from a young age. I didn’t enjoy it towards the end on television because I was a bit older then and I didn’t think it was a good. My era was for Peter Davison’s years and Colin Baker. That was my time. And then when it came off the telly, I mean, I used to read Doctor Who magazine and all these kind of things. I was very much involved in it and I was a big fan of it. So when the opportunity came up, it was a pretty easy one. I was delighted to be part of it. Gilles Nuytens: You’ve worked on many Scifi projects. Do you like this special universe? Ben Foster: Yes! I do. I’ve always enjoyed Scifi and also mystery and detective stuff. I used to watch a lot of what we call cult TV now. You know, The Avengers, The Prisoner, things like Thunderbirds, and the puppet shows from the 60s. I grew up watching that. That was my favorite type of thing. So I think I always wanted to be involved in that type of film and to do the music that goes with it. I think the good thing about Doctor Who is that we can be unashamedly big. I think the John Williams’ Star Wars stuff that I grew up with was one of my big moments when I said I want to do this for TV or for film because you can see the way classical music fits into that very futuristic environment and absolutely work. And I think I do love the use of synthesizers and stuff. There was a lot of that going on in the sixties with Barry Gray and various composers and that was always very interesting. I think what’s happened in history is the involvement of classical music and the symphony orchestra in Scifi has always been there. And it somehow doesn’t date it. I think it’s a very good thing. Gilles Nuytens: Are there any other TV shows or movies that you’d like to be involved with? Ben Foster: Well, I mean, there’s not a lot on telly at the moment that I’d desperately like to be involved with because I’ve been lucky with Doctor Who and Torchwood and those are two of my favorite shows--whether I was working on them or not, I’d certainly spend time watching them. So I’m quite happy with that, really. I do work on films for different composers. I am working on the film The Mummy 3, which is coming up in a couple of weeks. So I do get to work on other film projects. Although they don’t always happen to be Scifi. They can be romantic comedies or whatever kind of thing. But I do particularly love Scifi. Gilles Nuytens: Do you ever follow a particular composer or musician? Ben Foster: Yeah, my favorite symphony composer is a chap called William Walton. William Walton was a British composer. And he was very big in the thirties, forties, and fifties in this country. And internationally. I think he’s one of John Williams’ favorite composers. You can hear in John Williams’ work—while it has a lot of Americana—it also owes very much to composers like Holst and William Walton. All the great British composers. So I think we have a good heritage in Britain of really good Classical composers. I think, although I love Stravinsky, too, but I mean there are so many, but William Walton is certainly my favorite. Gilles Nuytens: You aided in the Doctor Who celebration in 2006. What memories do you keep from it? What was your favorite musical piece? Ben Foster: Well, I think my favorite moment in the concert was the Daleks because I was always looking forward to that moment performing that bit of music from the Dalek episode 12 and 13 of the first series. 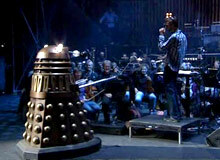 So when we did that with Daleks on stage, it was just something else. It was brilliant. It all came to life in the moment because the Daleks were roaming on stage and it all became quite scary and quite real. So that was my highlight. But it was an incredible few months, actually, putting the concert together. It really shouldn’t have happened because there was so much we had to do in such a short space of time. I still don’t know how we did it, really. 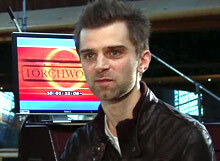 Gilles Nuytens: After your work on Doctor Who, how did you join the Torchwood crew? Ben Foster: Well, Murray was asked to do the music for Torchwood and he invited me to work with him on Torchwood. And then it became clear that he didn’t have the time, so I became the full time composer for Torchwood. In fact, Murray wrote the first episode of Torchwood and then episode four came next and then he handed it to me and I just ran with it and did the rest. So that has been very fortunate to work and because it’s the same type of people, the same people who do the sound mix, a lot of the same directors, it’s kind of a family thing, that you know all of the same people that work on it. It was very easy to graduate from working on Who, to working as a composer on Torchwood. Gilles Nuytens: Have you worked with Murray Gold on the main title? Ben Foster: Yes, there are few different versions of the main title, in fact. We did a version with our orchestra in London and then it got edited, I think. We did a thirty second version and the twenty, and the final version with only a ten second version, so, actually, there are few different versions knocking around that are quite different, but the version we use in the final mix, I think is the best of them. It’s very short and very repetitive and just does what it needs to do. Gilles Nuytens: Have you worked with Murray Gold on other TV or film projects? Ben Foster: Yeah, on many, many different projects. We’ve done a few films. Recently we did I Want Candy, but that was last summer. That was a while ago now. Murray’s been so busy doing Doctor Who that he hasn’t had too many films at the moment. But we did Frank Oz’s Death at a Funeral, which was great fun. And there’s been a few other TV projects we’ve done. But yeah, we’re very close collaborators. It’s been a very busy few years. Gilles Nuytens: How do you compose episodes and series? Do you hold meetings with the script writers and directors? Ben Foster: Well, with the last series of Torchwood, there were meetings that had tone meetings up at Cardiff, and there are initial discussions and read-throughs of the scripts. I went to them initially in series two because as you start there is nothing to do for a few months and then suddenly it becomes very busy. So I was involved in an early stage, but it’s less useful for a composer. I think it’s good to get the scripts and read through the scripts, but the scripts change and then of course when it’s shot it’s very different. And then I have a meeting with the director, which is literally an hour with the director, watching the episode, and talking through it pretty much in real time. And then I go away, write the music, record the music in London, and then send it up via the Internet to Cardiff. The first time they’ll hear it is in the final mix. It’s a very efficient and swift process, which is good. And it’s nice to be working on your own because it’s such a huge thing. The deadlines can be so terrifying because you have one episode to do and another one to start the next day after you finish the first. So it’s good to just be in your own world and get it done. Gilles Nuytens: Have you been on the set during script shootings? Was it as crazy as it is in the show? Ben Foster: I’ve been a couple of times when I had meetings in Cardiff and they’ve been shooting so I’ve sit up in the sidelines and have watched. They have a lot of fun, I think. The characters are great fun. I think John Barrowman has a lot of laughs with the crew. It’s lovely to be on the set because suddenly you see so much. To actually stand in the middle of the Torchwood Hub is really incredible. And of course it’s next to the TARDIS set as well, so it’s a really nice time to hang around the set. You see all of these things. And I’m still a fan. Although I’m involved in the show, I still want to see the TARDIS. I still kind of get excited. 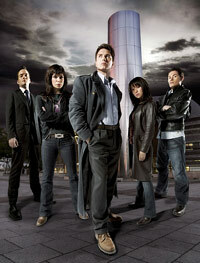 Gilles Nuytens: Which are your favorite episodes of Torchwood? Ben Foster: I think my two favorite episodes in series two are episode eight, “A Day in the Death,” and episode eleven, which is “Adrift.” The first one is the episode where Owen talks to Maggie on the roof and we hear all about Owen after he’s been shot and brought back to life. So there’s some really good music there. I’m proud of the music there for Owen. I think that worked really well. And then episode eleven, which is the one about the boy Jonah who goes missing and comes back. I’m very pleased of the music. The music turned out very well for that. They are two very different episodes. I really like Torchwood because of its style. That episode eleven was incredibly moving. And when you compare that to something like episode one or episode ten, the cinema one, they’re kind of quite different, but they all work together. And that’s the thing of it as a composer: it’s a great challenge. You have to make different music, but it all has to sound like it’s for the same show. So it’s good fun. Gilles Nuytens: Did you choose all the pop songs in series two? Or did you write the final captain song in the final episode of series two? Ben Foster: The thing is, most of the pop songs that go in come from the producers or the directors. So actually I have nothing to do with that. All that I have to do is score the music. There were a few incidences in episode one and episode three that used a few pop and rock tracks. I think they work well, but I think, as a composer, you probably would rather write music for it. It’s not a problem when they use songs, but I prefer it when they don’t, to be honest. I think it breaks the barriers down. It becomes a show that maybe it isn’t. It kind of Americanizes it a bit too much, as well. I think it has a different effect, putting a pop song on it. It becomes more like a montage and less powerful. So, no, I don’t used those. Gilles Nuytens: Now about John Barrowman and James Marsters. One’s a musician and a fantastic singer. And Gareth David-Lloyd is also a singer. In series three, if you make them sing, what would you think of it? Ben Foster: Do you think they could do a song together? It could work. I’m not sure. I think they all have fun on set, don’t they? I think James has his guitar and he plays and I’m sure Gareth would sing with him, but I don’t know. John’s quite a showman, isn’t he? He’s more of the kind of West End style. He’s less of a rocker. I think Gareth and James could have a good band together. They’re more in the same place of the world musically. But whether or not, I don’t think it would work so well on the show. But I think maybe that’s something they could do separately, as a sideline. 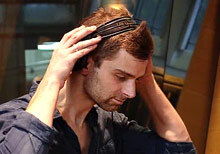 Gilles Nuytens: In series one, the soundtrack is very low in the background. 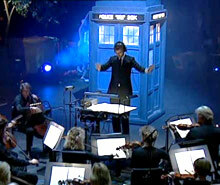 In series two, the music is more prominent. You can hear it more than in series one. Is there a reason? Ben Foster: Well, I don’t know if that’s true. I think the music at times in series two is incredibly quiet, actually. I don’t know whether you’re talking about a mixing or a sound. What we did for series two was work with an orchestra, we worked with BBC National Orchestra of Wales, but we also, every episode, we recorded bits in London with the London Television Orchestra. And that’s what we did in series one, actually. Series one was all done with the small orchestra in London. But just in series two we did some early recordings with the BBC National Orchestra of Wales. And I recorded a lot of themes: Owens’s theme, the death scene at the end, and bits and pieces like Captain Jack’s theme. It’s useful when you’re doing such a bit show to have a lot of set pieces that you can use. It’s similar to what we do with Doctor Who: we record a whole library of music that relates to the characters and then can be edited and used in certain places. So that’s what we did for this time around. I don’t know if it was intended to mix, or if it was louder, but I think it might have a bit more punch to it. Because there is so much music in Torchwood—there’s up to forty-five minutes—I think the most we ever heard in one episode was forty-six minutes in a fifty minute episode. So that’s an awful lot of music. But it doesn’t have to be so prominent. I think at times it fits into the background very well. Gilles Nuytens: Your compositions in series two give a strong musical identity to the show. Which are your favorite themes? Ben Foster: Well, I think the nice thing about series two is the way we have the constant references to Owen and we have references to Owen and Tosh and their relationship. Also, we have Gray’s theme—Jack’s brother’s theme. Those are the three big themes for me: Owen’s theme, Tosh and Owen’s theme and Tosh’s theme, and the theme for Gray. Because they recur and you can bring them back here and there. Part of my job as a composer is to subtlety put little bits of the theme here and there. And at certain times if you listen through the whole of series two, there are a lot of moments where you hear Owen’s theme and you hear Tosh’s theme together, so it was always hinting at this moment at the end of this series when they die together. So, yes, this series in terms of themes has been stronger because it had been written that way. There’s been an arc to it, as it were. There were a lot of themes that I set up in series one, like Captain Jack’s theme, that I continued with, and Gwen and Rhys’ theme. That was in series one. And I brought that back and used that in the wedding and all that kind of stuff. I think my most favorite is Owen’s theme. That’s probably my favorite. And I’m so sad he’s gone as well because it means I can’t really use it again, unless they talk about him and then I can use it, I suppose. Maybe he’ll come back from the dead. They always do. 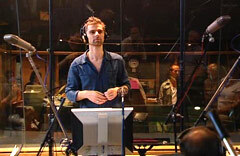 Gilles Nuytens: Owen’s theme gives a great intensity to series two. Why give such a strong theme to a character who is going to die? Did you know what was going to happen to him? Is this theme going to be in series three, maybe? Ben Foster: I liked Owen’s character very much and I thought he deserved a really big theme. And it was a simple theme. It’s just five or six notes that goes ‘round and ‘round, so it’s easy to spot, it’s easy to recognize. It wasn’t clear from the beginning, actually. It wasn’t clear when I started to write that he was going to die because they keep everything very secret, but I think that’s actually because they haven’t written it. So when they start the series, they haven’t finished the end. I have two different scripts for episode thirteen, so it did change. There were slight changes there. But I recorded early on in August of last year a lot of music with the orchestra in Cardiff and Owen’s theme was one of them. The arrangement that I did in episode eight, when he’s going up the stairs, the rock version, that came as a surprise really because it was never really going to go that far, but then when I saw episode seven and episode eight, I realized just how tough he had become in episode seven in the way that he’s brought back from the dead and he’s just fine. I just thought it suited him really well. So, I suppose as an arranger it’s nice to have the opportunity to take a theme that can be quite tranquil and quite beautiful and make it something very angry and angular and tough. I think that’s what I really like about Owen’s theme: it was very good value. It was able to be transformed in lots of different ways. And also with a simple theme like that you can play that over a lot of other piece’s of music. And, in fact in episode thirteen, I just put it over lots of different pieces of music and also Tosh’s theme, so it was really good value. It was quite efficient writing, I think. But I have to say: it’s a shame he’s gone because I was pleased with it. But we’ll write another one, I’m sure. I’m sure we’ll come up with something better. Gilles Nuytens: In Scifi, everybody can come back from the dead. Ben Foster: Exactly. And I’m sure he will. I hope he will. Gilles Nuytens: So we saw you singing for Voyage of the Damned in the Doctor Who Confidential. Were you in the Torchwood chorus, too? Ben Foster: Well, we don’t really have a Torchwood chorus. You mean in the opening? That’s just Murray whispering in his studio, doing Torchwood. I’m not the world’s greatest singer. Gilles Nuytens: You used a chorus for Gray’s theme in episode five of series two. How did you compose this theme? Ben Foster: It was just one singer. It was a girl called Analise that I used to go to college with and she came around the studio and she sang. I worked with her before. She’d recorded pieces I had written in the past, so I knew that her voice would be perfect for Gray’s theme. And I talked very early on about doing a choral thing, for Gray. I just thought it would work. I just thought it would really work because it’s that kind of thing when you’re trying to do something in the fifty-first century, it’s hard to use electronics because are they futuristic? They’re not really. It didn’t really seem like they had electricity, so I wanted to make it very organic and very real. But I thought the human voice is something that never changes so that had to be what it was. So, yes, that was a big part of the identity for Gray: that voice. I thought it worked very well. But that was just one person. We recorded it in various different ways. She was singing, and she was humming, and she was doing all sorts. It’s quite a few different takes put together. Gilles Nuytens: The Weevils theme sounds Oriental at the finale of series two. How did you make this choice? Ben Foster: Well, it was something I wanted to sound surreal, something that sounded of another world. And so it was something I did in series one, actually. The first time we see the Weevils in episode three or four, and I used it through “Fight Club” and then toward the end of episode twelve and thirteen in series one, so you think that’s another theme I can bring back, but that was played on the viola. And it was played on an old viola which is called a viola d’amore, which is an old baroque instrument. It was played in a very kind of Eastern style. The player, a chap called Peter Lale, is a viola player. He plays a lot for composers like Hans Zimmer. I think he played on the Da Vinici Code, maybe. He plays a lot of solo stuff and he’s very good at that kind of thing, so that it sounds a bit otherworldly. That was good for the Weevils because nobody knows where they come from. They got that very barbaric and very animal, very earthy, look to them. I thought it would work. Gilles Nuytens: The Cardiff's destruction theme is freaky and noisy. How does it feel to compose a demolition? Ben Foster: It’s a bit sad to see Cardiff go again. It’s funny because they did that at the end of thirteen last time with Abaddon stomping his way around the car park of St. David’s hotel. It’s a bit of a shame, really. They will always put it back together. It is sad that the end of the world always seems to come to Cardiff, but there we go. That’s what happens when you have a rift running through, I suppose. Gilles Nuytens: Can we look for a CD release of Torchwood series one and two sometime? Ben Foster: Yes! But nobody knows it yet. So this is an exclusive, actually, which is nice. 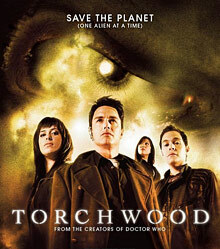 We are releasing a CD of Torchwood. And it should be out in August, I think, in the UK. I’m just putting it together now. I got nearly the final place. It’s very hard because there’s so much music. There’s eighteen or nineteen hours of music in the two series, so to choose the best is nearly impossible. It takes a lot of restraint because you kind of want to put everything on, but you can only put eighty minutes or something on it. So it’s very hard work. I think there will be a lot of music from series two and less from series one at the moment. I think partly because when you write something that was a long time ago, it was eighteen months ago, so I think you’ll want the latest stuff to be out. And I think series two was much more successful in terms of audience. It got a lot more people, it became bigger, and more people are watching it. So I think it’s nice to celebrate the recent stuff, the last series. And also, it’s nice to see the arc of the developments of the characters from series one. It’s also not quite clear yet exactly which because there are certain scenes I do like from series one, but we’ll have to see. It’ll definitely be coming out in August in this country, and I’m sure it’ll be on iTunes and all that. But it should be really good, it’s very exciting. Gilles Nuytens: Will you work on series three? Ben Foster: Yeah! I mean, it’s not one hundred percent confirmed yet when it is and what it’s going to be, but certainly yeah. I’m very much looking forward to getting going again because it’s something that takes six or seven months of your life up. So when it stops, I mean, it’s very busy now with Doctor Who, but you kind of miss working on it. And you miss the characters. It’s funny, you know. And you kind of miss their kind of company and their adventures. I’ve been looking forward to starting again. Gilles Nuytens: What are your other projects? Ben Foster: At the moment, it’s Doctor Who. We’re working on the finale. We’ve been recording here in London individual episodes. We did episode ten a couple of weeks ago and now we’re working toward a recording on Tuesday and we’ll be doing that in Cardiff with the orchestra. We’ll be recording episodes eight and nine, which will be the Steven Moffat episodes, “The Library,” and we’ll also be recording music for the finale, which, I think it’s no secret: features the Daleks. So that’s what I’m working on right now. I’m also working on a couple of pieces that reprises character themes because there are characters that return, as you probably know, toward the end. So we’re going to be rerecording various themes for Rose and also for Donna. So we’re having a lot to do next Tuesday. So I’m nearly finished. And I’m doing a film called The Mummy in the next couple of weeks for a composer called Randy Edelman who’s a Hollywood composer. I did another film, British film last week, and just lots and lots of stuff. Of course there’s a Doctor Who concert coming up in July, which is going to be in the Albert Hall, in London. So I’m going to be working on that as soon as I can over the next month because we have got to put a whole lot of music together for that. And that will be tremendously exciting, but will be a lot of work again. But that’s what I’m kind of up to, really. Gilles Nuytens: Now I’d like to ask you if you would be interested in coming to the first French "Who-niverse" convention. Ben Foster: Oh yeah! When’s that? Gilles Nuytens: It’s on August 30th. Ben Foster: Where is it? Gilles Nuytens: It's in Paris. Ben Foster: In France? I’d love to. Any trip to France would be great. I love the South of France, particularly. I go there quite a lot. Give David a call! I’d love to do that. I’m definitely in London at that point. Gilles Nuytens: My partners will be very glad to hear that. Ben Foster: That’s great! That sounds fun! Gilles Nuytens: That’s all the questions I have. Ben Foster: Good! Thank you! Gilles Nuytens: Thank you very much for your time. Gilles Nuytens: Is it holiday, a day off today in Great Britain (May 1st)? Ben Foster: No, there’s a bank holiday on Monday, but I don’t think I’ll be having a bank holiday. I got to work. Recording on Tuesday, so I’ll be traveling to Cardiff on probably Monday or Sunday. So now I’ll be in Cardiff on Monday having a meeting with Murray about the concert. So it’s pretty non-stop until August. I think the first of August is my next day off. And then I get a couple of weeks and then we’re hot.